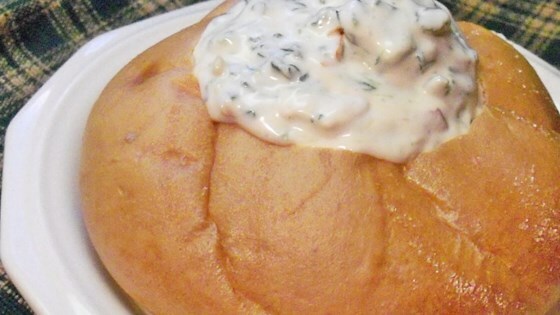 "This is a great recipe for cold spinach dip. Serve it with vegetables, crackers or bread." In a medium mixing bowl combine spinach, sour cream, mayonnaise and vegetable soup mix. Mix well. Refrigerate it for 4 hours. Stir before serving. I get so many compliments when I make this. I use dry onion soup mix instead of vegetable soup mix and everyone raves over it. VERY quick and easy! Yummy taste too. You can even reduce the sour cream a bit and use less mayo and it still turns out creamy! This is a great dip; however I did not add the vegetable soup but did add a package of ranch dressing mix. I added about 2 chopped green onions and used Knorr brand dry veg. soup mix (in my opinion it's the best). This dip is great and so easy to make! Great with bread, Ruffles, or veggies!!! I didn't even add the mayo!